APPEARANCE: Amanojaku are wicked monsters which have been known since before written history in Japan. 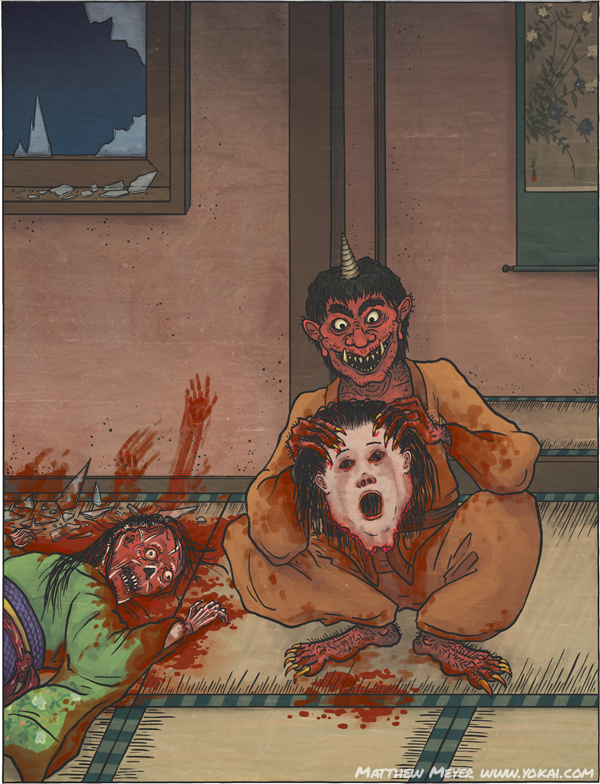 They are described as evil kami, minor oni, or yōkai who cause mischief and perform evil deeds. In particular, they are known for provoking humans into acting upon the wicked, impious desires buried deep within their hearts. They spread spiritual pollution wherever they go. ORIGIN: Although they predate Buddhism in Japan, amanojaku are frequently depicted in Buddhist imagery as symbols of wickedness being defeated by righteousness. In particular, the Four Heavenly Kings are depicted as standing on top of demons, squashing them—those squashed demons are said to be amanojaku. The god Bishamonten’s armor is also decorated with demonic faces, which are said to be this evil spirit. Amanojaku originate in ancient mythology. Though their true origins are a mystery, they appear to have developed out of ancient myths of wicked Shinto deities. 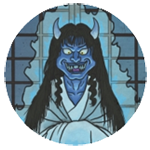 Amanozako, Amenosagume, and Amenowakahiko all share aspects of this spirit’s undermining nature. It is widely believed that amanojaku originated from one or even all of them. LEGENDS: The most well-known tale about amanojaku is the story of Uriko hime. In this story, a childless elderly couple discovered a baby girl inside of a melon. They took her home and raised her as their own, and named her Uriko hime. She grew into a beautiful young woman, and one day a request for her hand in marriage arrived. Delighted, her parents went off to town to purchase her dowry and prepare for her wedding. Before leaving, they warned her not to open the door for anybody, no matter what! Reluctantly, Uriko hime opened the window just a crack. As soon as she had done so, a long, clawed finger slipped into the crack and smashed the window open. It was an amanojaku! The amanojaku leaped at Uriko hime, tearing at her clothes. The young woman fought for her life, biting and kicking at the demon, but she was not strong enough. The amanojaku snapped her neck, and she died. The amanojaku didn’t stop there, however. It flayed Uriko hime’s skin and wore it like a suit, hiding itself in her clothes and disguising itself as the young girl. When the girl’s parents came home, they were fooled into thinking their daughter was still alive. Finally the wedding day arrived. The elderly couple brought the amanojaku-in-disguise to its husband-to-be. However, a crow in a nearby tree called out, warning the couple that their daughter was not what she seemed. They grabbed the bride tight and held her down. They washed her body until the flayed skin sloughed off, and the amanojaku was revealed. The amanojaku ran for its life, but the elderly couple chased after it. More and more people joined them, until a whole host of villagers chased the demon through the village. Finally, the townspeople caught up to the amanojaku and hit it with sticks, stones, and tools. They beat the demon into a bloody mess, and it died.